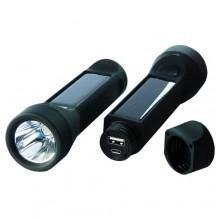 The POWERplus Salamander is a 3W LED flashlight and a 2.400 mAh powerbank. The POWERplus Salamander is made from high quality components and has excellent performance in both lighting and charging. Under the waterproof cap in the base is a micro USB charging in port and a USB charging out port. Connect your mobile device (mobile phone, GPS, PSP etc.) with its USB charging cable (not included) to charge your mobile device battery. The POWERplus Salamander is designed so that however you place it on a flat surface, the solar cell will always turn up, so it can charge using solar power.